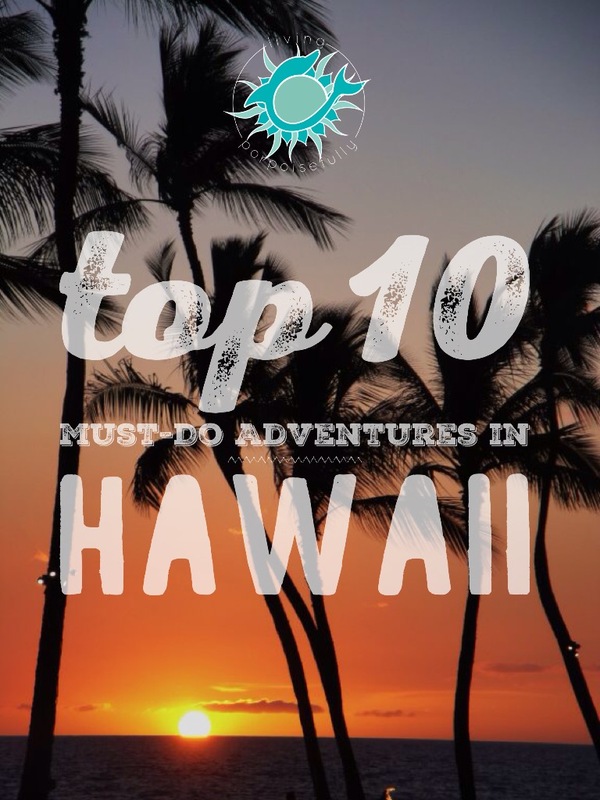 The adventures and sights that we got to see in Hawaii rocked our world, and from our 14 day visit, we created a list of the top 10 must-do adventures of Hawaii’s Big Island, plus a few bonuses that we just couldn’t leave out. 1. Go swimming with wild spinner dolphins. Even though we have supreme awe for all dolphins, it’s the spinner dolphin that truly steals our hearts. Why? Because they do something so spectacular, that you’ve got to see it to believe it. They race under the water, gaining speed, and then launch themselves (while spinning) out of the water. The most exhilarating part of this experience was watching them speed up underwater, and then lifting our heads to see them leap above the surface. Talk about witnessing one of nature’s greatest shows! The snorkel boat took us out to where the dolphins were, let us off the boat, and we went with the current. We got back on the boat when the dolphins left, and then got to repeat the experience when the crew spotted more dolphins. Here’s a clip for you to see the amazing acrobatics of spinner dolphins, but the video just can’t compare to the exhilaration of seeing it in person! 2. Relax on one of the most pristine and top rated beaches on the globe: Hapuna Beach. The chance to relax on the beach is, after all, one of the main reasons we went to Hawaii in the first place! It was clear to see why Hapuna Beach has been so well rated: it was truly a breathtaking scene. I don’t think we’ve ever seen water so clear, and waves so perfectly formed. The sand was divine under our toes, and the climate was the ideal warmth but not-so-warm-that-you-sweat! It felt like the beach beckoned for us to play in the sand, so we obliged and made a sand sea turtle among other sand creatures. We came back for a sunset or two, which was the icing on the cake! 3. Snorkel with green sea turtles. You can go on a snorkeling or scuba trip to a reef and possibly see a sea turtle or two, but we were so excited to learn that the place we stayed at (Waikaloa Village) had its very own lagoon, open to the ocean, where several sea turtles liked to hang out. We even saw them up close from a paddleboat and right on the shore! 4. Visit a black sand beach. As an avid sand collector (see my earlier post here), I just had to see if it really lived up to the hype. Was it really a true black or more of a gray? Well, it lived up to the hype and really is a true black – the pictures from far away don’t really show what the individual grains look like, which are all tiny black rocks. Surprisingly, even though the sand was born from molten volcanic rock that shatters when it cools quickly, it was rather soft and pleasant to walk on! It wasn’t just the sand here that made it worth the stop, but the half a dozen green sea turtles who basked in the sun without a worry. Most sea turtles never come back to land (unless it’s the female coming to shore to lay her nest), so this was quite the treat to see them so close and on relatively dry land. 5. See an active volcano. Hawaii was, after all, created because it’s a volcano! We went to the Hawaii Volcanoes National Park during the day, and saw the smoky billows coming out from the volcano’s crater. 6. Horseback ride in the hills of North Kohala. One of the things that was so fascinating about the Big Island is that there are so many different climates and scenes, from the beach, to the mountains, to the dry desert side, to the rainforest, to green pastures. The horseback ride through rolling, rocky green hills made us feel like we were somewhere completely different, like Scotland or Ireland. It was incredible to see the landscapes and sea views that we wouldn’t have been able to see on foot or from the car. Besides, there’s just something about riding a horse that puts you in tune with nature and what’s happening around you! 7. Wear a lei and go to a luau. Getting the chance to learn about and embrace Hawaiian culture through a feast worthy of kings was quite the welcome! The show of talents was impressive, and the atmosphere was festive and warm as the sun set through the palm trees. 8. See the tropical botanical gardens rainforest. We certainly didn’t expect the beautiful pathway that contained so many beautiful flowers and scenic views that we devoted a whole post to it! Click here to see it. 9. Take a submarine ride. As a marine biology teacher, a submarine ride sounded like an experience worthy of professional development! So we boarded the Atlantis and it took us down about 100 feet. We got to see a shipwreck covered with sea life: a crown-of-thorns sea star, sea urchins, and shimmering reef fish. 10. Watch the Hawaiian sunset. Sunsets are one of nature’s most beautiful phenomena, that conveniently happen on schedule. Sometimes we forget just how breathtaking it can be, and this was certainly a very significant reminder. We wouldn’t change a thing about our trip to the Big Island! So many adventures and experiences all in one place. Beyond the top 10, we also squeezed in a trip to Waipio Valley (a stunning overlook scene), Akaka Falls, Rainbow Falls, Japanese gardens in Hilo, a trip to the Pana’ewa Zoo, tidepooling on the volcanic rocks, a walk through a lava tube, and a taste of native dragon fruit. If a trip back to Hawaii is in our future, we’d love to go during the winter season to be able to see migrating whales (we went in July). While we were quite happy to spend all of our time in Hawaii on the Big Island, we may venture out and explore the other islands too. In the meantime, we’ll recall our incredible memories often and keep the Hawaiian spirit in our hearts. Mahalo!